I love cricket - and I'd love to get into NZ winning at the World Cup - but ever since the Black Caps decided to tour Zimbabwe - I've refused to support them. How we could have decided to take a tour of a dictator like Mugabe over and above a fine makes me feel ill. I've often wondered where America's much vaunted love of democracy disappears to when we talk about Zimbabwe- the only reason America doesn't invade Zimbabwe is because Zimbabwe doesn't have any oil. I also think it is time for South Africa to get over themselves and publicly move against Mugabe, there is an understandable deep resentment for the white world in South Africa and that plays into the reason why South Africa have done little to aid the white world in decrying Mugabe, but that is no excuse for doing what South Africa are doing. 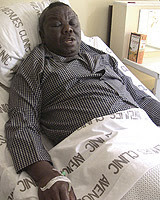 Morgan Tsvangirai lies in his hospital bed after being attacked by police. Nelson Chamisa, one of the opposition MDC members attacked last week, tells of his ordeal at the hands of the police: "I began protesting Robert Mugabe's Government nearly 10 years ago when a student. I was very young then, but I am bearded now and my voice has deepened. But still I was shocked by the savagery. "They were not beating only me, they were beating the 30,000 people who voted for me, who voted for change." Zimbabwe has a sh*t load of natural resources Bomber...the reason the US doesn't invade Zimbabwe is the same reason Britain doesnt, invading a 'black' country would bring about allegations of 'colonialism' and 'only doing it for the resources' by people on the left. Take a look at Sudan...US hasn't invaded there either. For the record, the countries doing all the 'invading' of Zim over the past few years have been the Chinese, Libyans and Indians...do some research and see who the big investors in mines and property have been. South Africa's silence is deafening on this issue. Sure Zim stood shoulder to shoulder with them in the apartheid years...but ffs this is way bigger than that now, the overwhelming majority of people suffering from Mugabe aren't white!!! Its time they took a stand on the issue as its tough to speak "for" Africa, and put pressure on Nigeria's democratic credentials whilst turning a blind to the horrors that take place next door. "In Internet terminology, a troll is a person who enters an established community such as an online discussion forum and intentionally tries to cause disruption, often in the form of posting messages that are inflammatory, insulting, incorrect, inaccurate, absurd, or off-topic, with the intent of provoking a reaction from others." Don't feed the troll folks!! Good to see you blog on this issue Bomber. I have been following it a lot of late. I see another key member of the opposition was just badly beaten...at the airport, when he was about to fly to Brussels to speak about the troubles in Zim at the EU. Savage. The body of an opposition activist who was killed by the govt. last week was also seized by govt. thugs so that his funeral could not be used as a rallying point for the opposition...heartless. I think it is a bit unfair to rag on NZ cricket though...they were in a damned if they do, damned if they don't situation then. You seem to see this as another reason to attack America, but come on. The people who should be applying more pressure are Mugabe's African neighbors, but, ironically, to many of them he is still seen as a hero. Shame on them. Would this be the same Mao who starved millions to death in the name of collectivising agriculture and in the name of socialism? There are real parallels between Mao and Mugabe in terms of the human suffering wreaked by both. I've often wondered where America's much vaunted love of democracy disappears to when we talk about Zimbabwe - the only reason America doesn't invade Zimbabwe is because Zimbabwe doesn't have any oil. There has been a change of opinion in America and they now think that intervening in other countries problems is wrong and will just lead to bloodshed and cause the whole world to justify hating them. Zimbabwe has come to crisis at a time when America is tending isolationist. It is up to the UN and international community to work this out.